Kings Mill subdivision is located in west Carmel, Indiana, near the intersection of 106th Street and Towne Road. The neighborhood features spacious lots with well-tended landscaping and mature trees. The community offers tennis courts, a pool, pond and nature areas. Shopping, dining and entertainment in Carmel, Zionsville and Indianapolis are easily accessible. 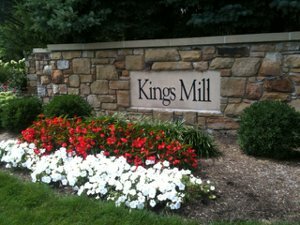 Average price range of homes in Kings Mill is mid $400s to upper $600s. Residents attend Carmel schools. Schools that serve this neighborhood are: Towne Meadow Elementary, Creekside Middle School and Carmel High School.